And you thought your debts were bad. 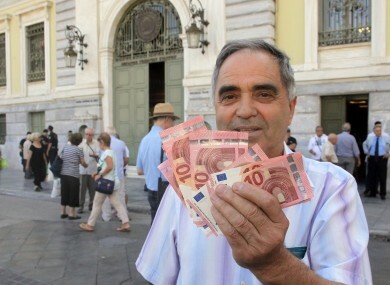 GREECE HAS MISSED a €1.5 billion payment to the International Monetary Fund (IMF) sparking fears it is sliding towards a messy eurozone exit – and it still has another €10.3 billion due this year. The country has in total borrowed €240 billion from a series of lenders, from the IMF to the European Central Bank (ECB), the European Investment Bank (EIB), European Financial Stability Facility (EFSF), European governments and private investors. The loans were made as part of two bailout packages, agreed in 2010 and 2012 to save the country from default as the financial crisis raged. Though the repayments are set to continue until 2045, the biggest – totalling some €15 billion – are due this year. After that, the country is expected to cough up €6 billion in 2016, €7.5 billion in 2017 and €3.5 billion in 2018. The next heavy year of repayments falls in 2018, when it owes €11 billion. Between July and December, Greece owes €10.3 billion to the IMF, the ECB and the EIB, not counting interest on three- and six-month Treasury bonds to be paid almost monthly. September: €1.6 billion to the IMF in four instalments due on September 4, 14, 16 and 21. December: €1.2 billion to the IMF in three instalments due on December 7, 16 and 21. Email “Greece has another €10.3 billion in debt due in 2015”. Feedback on “Greece has another €10.3 billion in debt due in 2015”.